Facilities: Three 5-a-side pitches, three 7-a-side pitches. There are a lot of 5-a-side facilities that exist in the UK. Most towns have several facilities that can be booked by the general public. Arguably we’re spoiled for choice. However, the quality of these facilities varies significantly – at one end of the spectrum you’ve got grubby, poorly-maintained pitches that you and your mates try to avoid. At the other end you’ve got fantastic gold-standard facilities that leave you desperate to get out there and kick a ball around. Recently, one of these gold-standard venues was opened by Powerleague, a major player in the UK small-sided football market. So when I had the chance to go there and speak to the staff, I jumped on it. 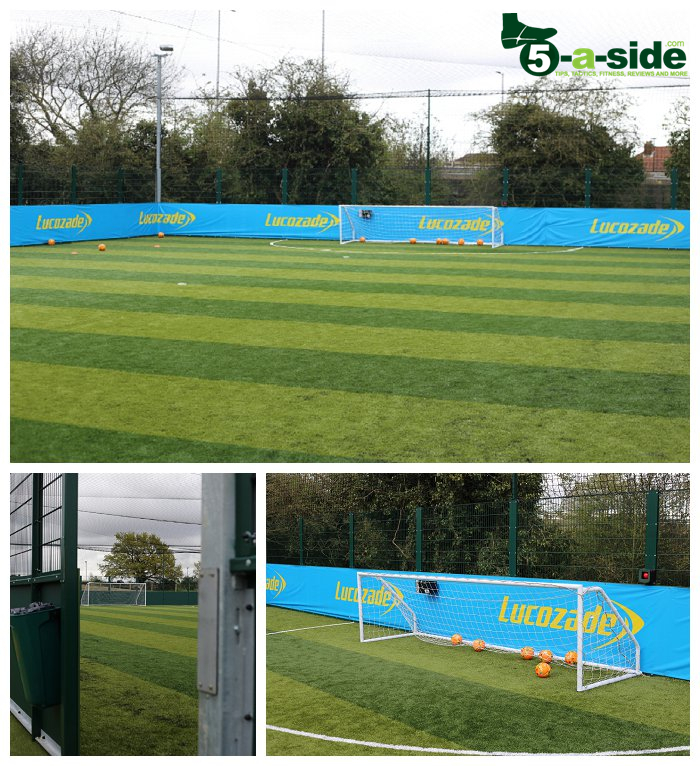 In this article, you’re going to see what a top-notch 5-a-side facility looks like, and the lengths that Powerleague are going to try to improve our footballing experience. For those of you outside the UK who don’t have facilities like this – it should be an insight into how things work here. The centre was opened just before Christmas in 2015. By the time that we got to take a proper look round (on the grand opening) it was April 2016. But the facility has been kept in cracking condition and was still looking brand-spanking new. 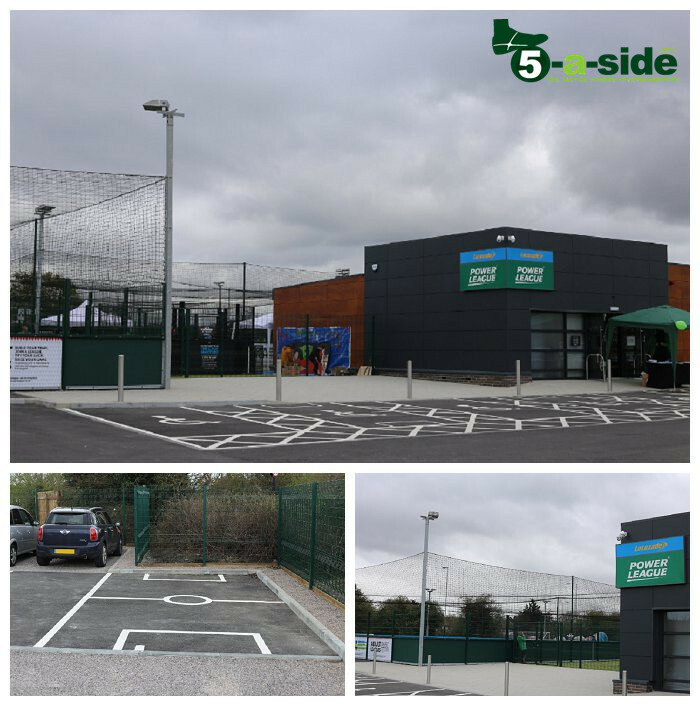 Three 5-a-side pitches and and three 7-a-side pitches have been installed to provide ample playing space. Each of them is named after a famous player, for example David Beckham or Paolo Maldini, and they’re built to standards that those legends would surely be happy with. The artificial turf has a delicious stripe running through it giving it a look of something you want to get straight on and play. They’re a fair size too, not one of those centres where you’re crammed into an impossibly small pitch. Importantly too, the pitches are all complete with overhead netting, so there’s no worrying about having to spend half of your booking time collecting your wayward shots. The pitches are, of course, the main draw, but what really makes this a great venue is the attention to detail that’s gone into all of the other little touches. They’ve addressed one of my major bugbears by putting an electronic clock on the club-house, bringing an end to all of those awkward conversations where one group want to get on and the other group think that their time isn’t yet up. Simple. Obvious. Yet something that hardly anyone does! 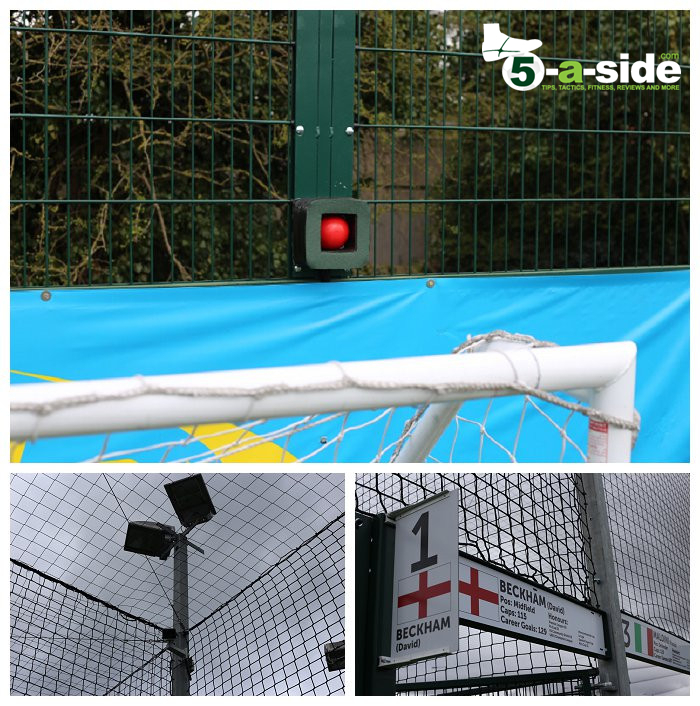 We’ve listened to customers and what they now need when playing 5-a-side. For example a secure place for valuables or somewhere to charge their phone. Many players come straight from work and by the time they’ve finished playing, their phone battery is run down. In response we’ve put in pitchside lockers with a phone charger inside. It sounds simple, but getting the basics right will make the playing experience much better. Here’s what they look like – complete with USB charger sockets. Another really great feature that separates the top providers from some of the budget venues is the provision of action replay facilities. Powerleague Sunbury has put this on one of their pitches. There is a red button on one of the pitches, that is linked to HD cameras around the pitch. If you score a fantastic goal, you nutmeg your mate, or an absolute howler happens, press the button and the last 30 seconds of footage is downloaded and then you can name and shame on social media as much as you want and celebrate that moment. There’s a curiuos little octagon between the pitches at Sunbury Powerleague. No, it’s not a cage-fighting arena where angry 5-a-siders can beat each other into last-man-standing UFC style submission, it’s much more civilised. Players can go 1-on-1 or 2-on-2 in a street football competition. 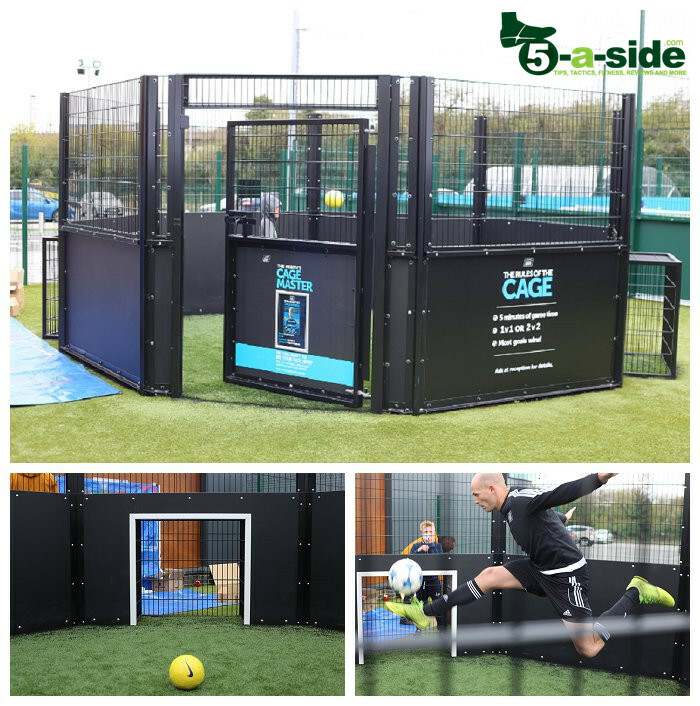 Even if you’re not blessed with twinkle-toes, it’s still a lot of fun kicking about in these cages, and it makes a great warm-up, especially if you’re waiting around before your game. What’s more, the cage is free to use and can become a real focal point if you spot a particularly tasty duel taking place. A far cry from your old school changing rooms, which were designed like the inside of a prison and smelt of decades of unwashed kit. 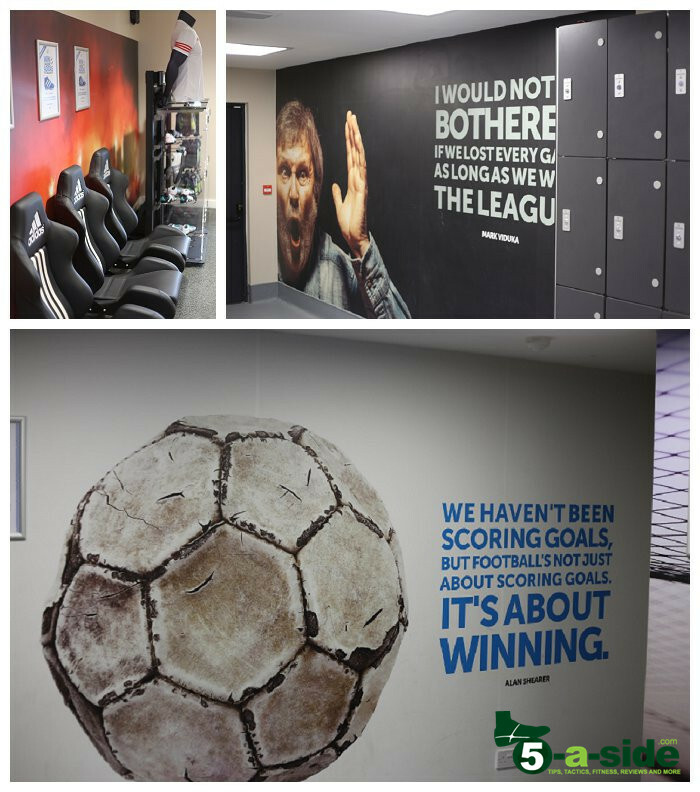 Powerleague Sunbury has modern, clean facilities which are nicely decorated with some classic football quotes. What’s more, a spearmint fragrance is pumped into the changing room at regular intervals to make sure that there are no nasty odors lingering around. A nice touch. I could go on and on, whether it’s the on-site shop selling Adidas footwear, gloves and shinpads or the fact that they’ve gone to the trouble of making some of the car parking spaces look like mini football pitches (seriously – that’s brilliant), this centre has been cleverly thought out. It’s nowhere near the largest centre in the UK, but it’s certainly one of the better ones. Powerleague aren’t the cheapest 5-a-side provider around. But what they are trying to offer is a premium footballing experience. The facilities at Powerleague Sunbury reflect this ambition of trying to be the best. But there’s more to it than simply laying on excellent venues. The company’s focus is on trying to provide the best overall experience for customers, and that means taking customer service seriously. The aim of the staff isn’t just to make you feel like another transaction, it’s about trying to help you enjoy the time you spend there, and engaging in the sense of community that playing at one of these football hubs can offer. In the long-run I think it’s this attitude that’s going to make a difference, just as much as having good facilities. How many 5-a-side providers out there have staff who want to know your name, and who care if your football experience with them is good or bad? In my experience, too many are just about collecting the match fees. One of the nice things about the UK small-sided football scene is that there are a lot of options. From the way you play the game, the numbers of players on each team, and the venue, the choices are endless. Facilities have evolved significantly over the past few decades to cater for us. No doubt these facilities will continue to evolve in the future. As such, Powerleague Sunbury is a great template for the next generation of 5-a-side centres, a benchmark against which others can be judged. Ultimately, if the future of 5-a-side football looks anything like this, the game is going to continue to do well. The location is great, I think the area has been crying out for something like this. A lot of customers come here and have said this is what we’ve needed for years – the children have got a safe place to come. It’s well structured, the pitches are amazing and the centre is well organised. 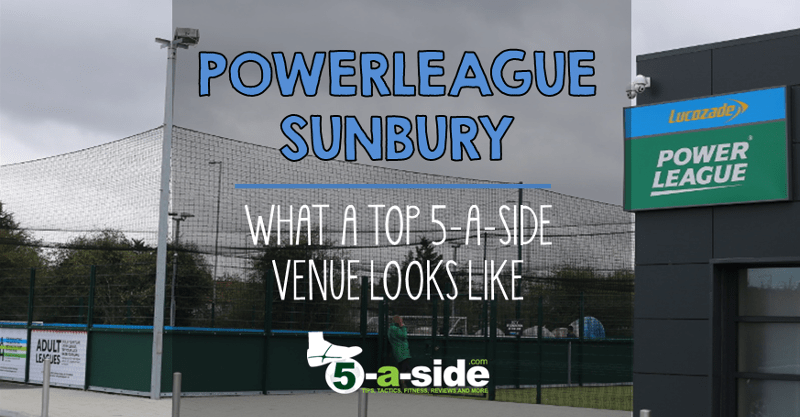 Note: this article is an independent look at Powerleague Sunbury. The site has not received any compensation or remuneration for posting this.